HBO viewers might be familiar with Ramin Djawadi, the man behind great opening scores like "Game of Thrones" and "Westworld", but now another Ramin - Ramin Bahrani - is taking Hollywood by storm! 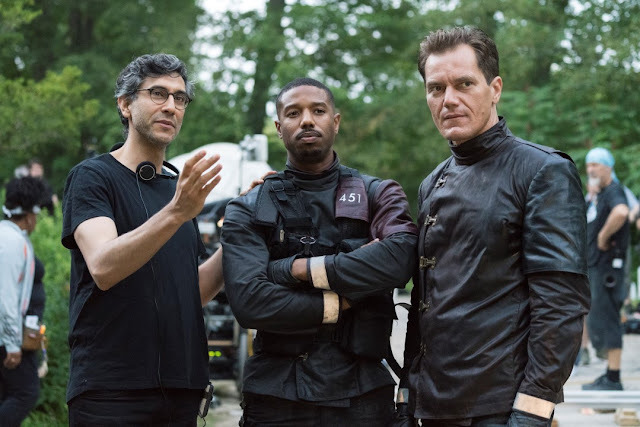 The filmmaker who has previously worked on critically acclaimed films like "At Any Price" (2013) and "99 Homes" (2015), has now taken the reigns for the HBO's "Fahrenheit 451", a dystopian film based on Ray Bradbury's 1953 much lauded novel. Before you get the film confused with a similar sounding documentary, the film is anything but that. "Fahrenheit 451" is set in the near future after a second American civil war has taken place. The media is the ultimate voice of authority for the people and history is re-written to fit whatever agenda that arises. In this world, so called 'firemen' burn books... and this is where actor Michael B. Jordan comes in. 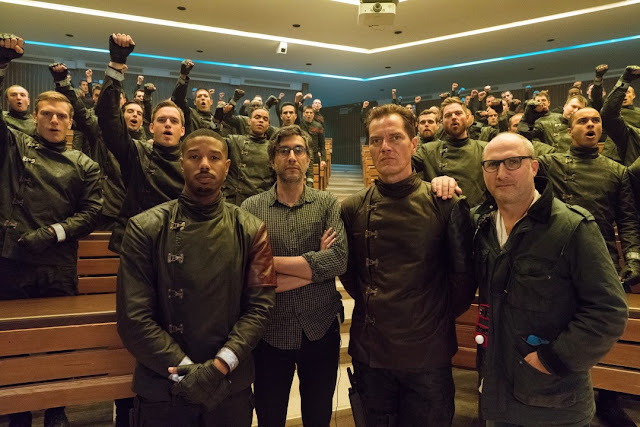 "The Black Panther" star plays the lead, Montag, a young fireman who questions his reality and turns against his mentor Captain Beatty (Michael Shannon of "The Shape of Water"). Sofia Boutella of "The Mummy" plays an informant for Captain Beatty but is also part of the rebellion to save books. With a plot like this that is as darkly eccentric as it sounds, it’s sure hard to give this a miss especially with big names attached to it. Ramin Bahrani talks about working with the cast and taking the colossal project from book to screen for the masses. "Fahrenheit 451" is now available on HBO on Demand (via Astro Go). Michael Shannon and Michael B. Jordan in a scene. Q: When did you first read Bradbury’s book? What was the key to reaching that younger audience? I thought I had to include technology and social media. That’s what, in 2015, first got me rethinking about the novel. The Internet and social media seemed to have, in a new way, caught up to Bradbury’s ideas. You could burn books but people would just download them again on the Cloud. The censorship and repression of things on the internet could be happening in America, or might happen the way you see it in other countries, like China and North Korea, Turkey, etc. I thought, ‘Well, do we have that in America?’ Maybe. How close are we to that? And how would I deal with that?’ I was curious to see what would happen. So from that spark of an idea, what happened next? I thought about it in 2015. I talked to HBO about it and it took them about a year to get the book. So I didn’t start writing the script until January 2016. Had you always planned to work with Michael Shannon again? Oh yeah, we really clicked on “99 Homes” as artists, but also we became friends later, off camera. When HBO said they got the rights to the book I called him and said, ‘Would you play Captain Beatty?’ He was the first call. I hadn’t written anything. When he said yes, I was able to write it for him, which helped because Beatty talks a lot, and he talks in a verbose, literary language, like in the book. In the book he’s constantly quoting things, and I knew Shannon could bring that to the ground and make it feel very grounded, real, and complicated. Shannon has a way of giving one look that has four meanings, and you don’t quite know what it is. There’s a depth to him, there’s a weight to him, there’s humanness to him that I thought could keep a character grounded. 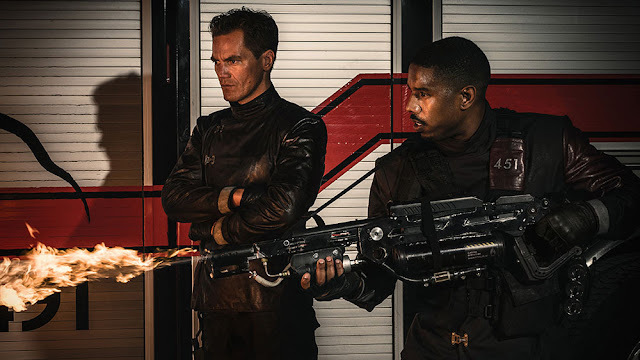 Meet the ‘firemen’ in “Fahrenheit 451”. We’re used to seeing Sofia Boutella in very physical roles. What made you know she was right for this far more cerebral part? Her audition was great. She was proving that she could do it. She was proving that she’s more than physical. She was proving she has a depth, a sensitivity and control as an actor. And I wanted her to have that chance to do it. You talked about wanting to speak to a younger audience, too. It seems like Michael B. Jordan, with all his success at the moment, could help you with that. I didn’t cast Jordan because of a young audience. Montag’s character should be younger. I cast him because he’s a great actor. I loved him in “The Wire”, which is a show I loved and “Fruitvale Station”. When I saw that, I actually at first didn’t understand that he was the guy from The Wire. I was like, ‘This guy is amazing.’ And I researched it and I was like, ‘He was in The Wire?’ and I realised it was the same guy. Then “Creed” showed up and again, he’s just elevating his performance every time. I just thought he’d be a perfect Montag because it’s a physical role but it’s also a sensitive role. It’s a delicate role, and it’s also got a lot of contradictions. Like Shannon’s character, he’s also contradictory. He’s hiding things all the time and he’s searching in himself, and he has to pretend and lie all the time. I wanted the bad guy to be kind of likeable.